It’s February and Valentine’s Day is almost here! It’s definitely a time for the romantics and lovebirds. Showing others how much you care is always important and appreciated. However, many people feel pressured to pull out all the stops on Valentine’s Day. That can be especially tricky for students and recent grads. If money is tight, don’t worry about it! It’s not about how much you spend. It’s about expressing your true feelings! You don’t have to eat out to have a romantic night. Instead, try cooking a simple, tasty meal and playing some board games together. Whether it’s Monopoly, Battleship, or Parcheesi, spend some quality time together and play a game. Uno! Get outdoors with your loved one and go on a stargazing adventure! Pack cozy clothes, a warm blanket, and some midnight snacks. You can also take a book of constellations and take turns naming the stars. There are certainly some romantic myths hidden in constellations, so read up on them beforehand and wow your date with your knowledge! While this plan may be tricky if you live in an urban area, consider taking a drive into the country to bask under the stars. Instead of going out to the ever-popular and expensive Valentine’s Day dinner, consider going out to brunch! This allows you to have a romantic meal and eat delicious food without emptying your wallet. It’s also a good plan if you’re late to making dinner reservations. Brunch is the most important meal of the day, after all. Take your special someone on an adventure close to home. Consider exploring a part of your city you’ve never been to. Find a new, untried place for lunch, admire the sights, and peek in unknown shops. Consider taking a walking tour of your city. A little crazy local history is surprisingly fun when your loved one is along for the ride! Not only is this an inexpensive option, it’s also very flexible. 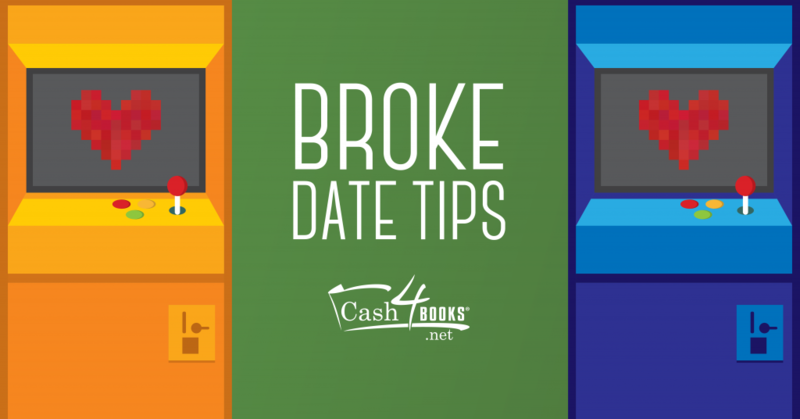 Hurray for broke date tips! This option takes a little research, but consider going to a free show at a local coffee house or comedy club. Whether it’s a band or some stand-up, you’re sure to have fun! Even if the music or comedy is terrible, you have each other to laugh with. Consider checking out local event calendars and bulletin boards to find fun, free events. While they might not take place directly on Valentine’s Day, you should definitely find some fun events that weekend! Get a pad of colored paper and write short, sweet, and thoughtful notes for your loved one. Put them all in a mason jar and tie it with a bow. Now, whenever they need a little support or a pick-me-up, they can read a sweet note from you! This incredibly personalized and thoughtful gift can take some time to create, but it always makes an impact and is quite cheap to make. If you and your date are major music buffs, this Valentine’s Day plan is for you! Create a custom playlist just for them and go out for a scenic drive with epic tunes. This customizable activity is another inexpensive yet thoughtful option. Gather all your loose change and take your date to a classic arcade! This ensures your day is full of laughs, a little competition, and tons of fun. Who doesn’t love some Pac-Man and Frogger? This cheap date idea is sure to make your day unforgettable. Now that you have fun, cheap date ideas, have a great Valentine’s Day without breaking the bank. Romance is in the air — even if your wallet is empty! Need some last-minute cash anyway? Sell your used textbooks to Cash4Books and use that money on your loved one! Additionally, use our bonus code and get 10 percent bonus cash added to your total.